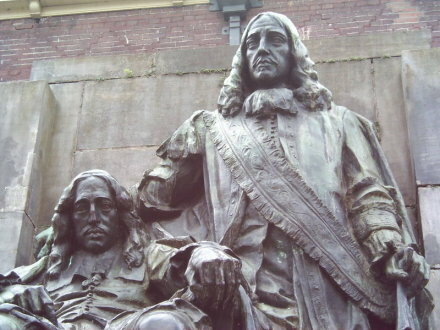 But the Third Anglo-Dutch War was the charm — as it was also the Franco-Dutch War, and therefore 1672 was Rampjaar: disaster year. While the Dutch were aces on the waves, a massive French invasion easily overwhelmed them onterra firma. 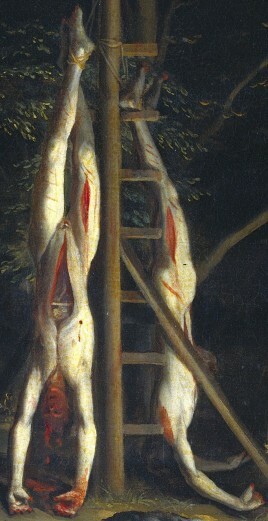 Detail view of a grisly painting of the mutilated de Witt brothers strung up at The Hague. It’s attributed to Jan de Baen, who in better times took Johan de Witt’s portrait. every one of the miscreants, emboldened by his [Johan's] fall, wanted to fire his gun at him, or strike him with blows of the sledge-hammer, or stab him with a knife or swords, every one wanted to draw a drop of blood from the fallen hero, and tear off a shred from his garments. -History of the administration of John De Witt, grand pensionary of Holland, a Google books freebie. But William’s own ascent to this wealthy sovereignty was just the beginning for him. Sixteen years later, the House of Orange’s champion vindicated Cromwell’s trepidation about him and gained a far more satisfactory position from which to do battle with his Gallic rival Louis XIV by stunningly overthrowing the Stuart dynasty and becoming King of England in the Glorious Revolution.